Our apartment is light, warm, very private from other apartments (you dont see them! ), and a beautiful view overlooking Quay Street, to the never ending busy Auckland Port and beyond the busy harbour watching the sails go by. Very quiet position but yet a stones throw from Spark Arena. 24/7 Supermarket (Countdown) across the road for your convenience. Centrally located to encompass any adventure desired, whether it is taking a trip to an island via Fullers ferries, adventure parks, boat/bike hire, sailing. Secured optional parking within the complex (must be advised if required upon booking request) with the easiest on/off access to motorways. Only a 10 minute walk to the viaduct, public swimming pools and upbeat restaurants, clubs and Queen Street. Bus stop outside to travel east around the bays, or the train is only a mere 8 minute walk away to visit suburban shopping malls. Air-conditioning, Mysky tv, Netflix, 50 inch tv, 1 king bed with ensuite, the other room has 2x king singles, both bedrooms with double wardrobes for clothing storage. One-off cleaning fee required of $100 per stay. Not suitable for young children under 5 yrs. This apartment is owner managed, therefore we pride ourselves with presentation, cleanliness and efficiency. It has been recently refurbished with quality comfy beds and furnishings. There is a Nespresso coffee machine available also. Minimum 3 night stays - Body Corporate Rules to adhere to - no parties/excessive noise; - No smoking/pets within the complex. Not suitable for kids under 5 yrs. The Apartment is expected to be left in a clean and tidy condition as you found it. (we take care of the washing/general cleaning). Please read House Rules before committing. Has great views, quiet, warm and sunny. Watch the oceanliners come in and out and the beautiful sailing ships go by all day long in the harbour. If going out for the day on a road trip, motorway access also within 1 km in any direction chosen! 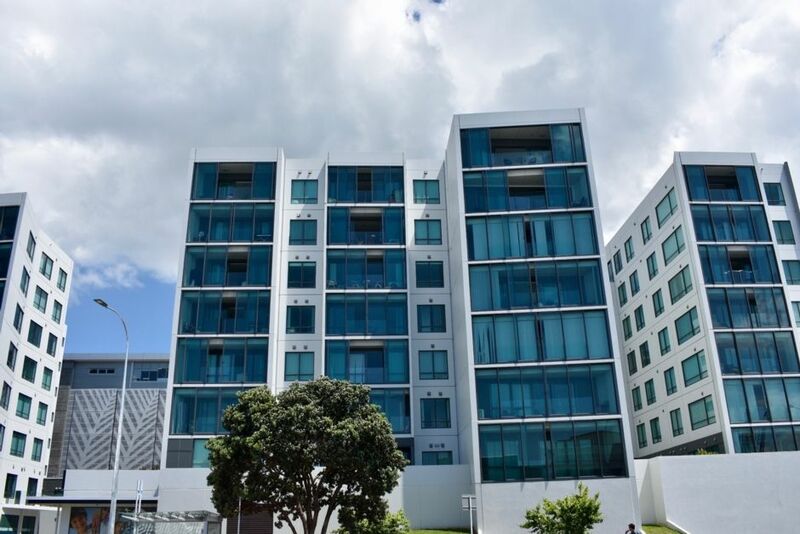 6th floor with expansive views of Auckland Port and harbour - you don't see other apartments here! There is across the road (but not seen either from apartment), the only 24/7 supermarket in nz.... so handy when eating in. in the Britomart vicinity, close to shops, restaurants, public transport - train and buses. The apartment has fantastic views of the port and harbour beyond which is continuously busy. There is mobile coverage but NO landline. Yes much needed, especially in the summer months. Seldom used for heating as the apartment is continuously warm. Kitchen is modern with induction stove top, oven, dishwasher, fridge with freezer below, Microwave and an Espresso coffee maker. Dining area is a breakfast bar with stools. There is also a small table and chairs on the deck. The apartment was clean and comfortable and conveniently located near harbor and central business district. The unit was well appointed with extra conveniences like covered parking, complimentary coffee, hair dryer and Netflix. The owner was very friendly and accommodating and helped to make our stay very comfortable. Easy correspondence. Super clean. Can’t beat the location! Great view and lots of entertainment watching the working port and the many boats in harbour. Thank you for a great stay! Enjoyed our stay at this very comfortable apartment with 2 full bedrooms and 2 full baths, a nice kitchen/living area, and small balcony. Excellent view, including working port with ships loading and unloading. But still quiet in apartment. Very convenient with major grocery store less than a block away. Denise was very helpful and accommodating, letting us check in a few hours early after our overnight flight in. There were also many supplies for laundry, kitchen, etc. that we were free to use. Easy walk to ferries, Britomart, downtown, etc. Good cable, Internet. Although location is near Spark Arena, don’t get dropped off or picked up there...better place is street intersection across from the grocery store. Denise was wonderful! She met us and showed us around her beautiful apartment. The location was prefect, easy walking distance to the ferry terminals, near restaurants and shops and a supermarket across the street. We would high recommend this apartment. Well located and appointed, close to everything. We had an excellent stay at Denise’s place. The location was fabulous, easy walking distance to the Viaduct and ferry terminals, with a large supermarket across the road and minutes to Britomart. Everything we needed was in the apartment. Highly recommended! Neighbour to Spark Arena where concerts are held but not heard from the apartment - of course! Beautiful harbour views and handy to all amenities and public transport.